Edit: After a New Years Eve Trail Run it brought my mileage up to 671. Video/Slideshow of various trips I did this year in the Olympic National Park. I was blessed to travel past my goal of 600 Trail Miles with 671 miles all in the Park. All my miles are done with Vibram Five Fingers or Bare. Since a lot of miles were on sharp rock, rubber was used to protect my feet most of the time. I want to say how blessed I feel to be living my dream on getting into the Park so much. The connection that you experience while traveling when you can feel every rock, root, water, snow, cold and Hot is in-explainable. I would classify it as a Spiritual Experience. I would also like to say a big Thank You to all the various Trail Partners I had this year. I also got to meet a lot of new people while Hitch Hiking and on the Trail. I am Stoked to get out for some Epic Adventuring in 2012 with you all. With the New Year look for a Summit of Mt. 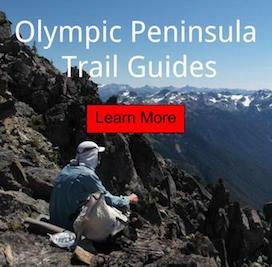 Olympus, lots of Trips into the Bailey Range, the Wonderland Trail and lots of other various Trips. Disclaimer: Train your feet for several Months/Years before attempting anything seen on this Site. For tips on how to Train or Stretch your feet properly. Feel free to email me.